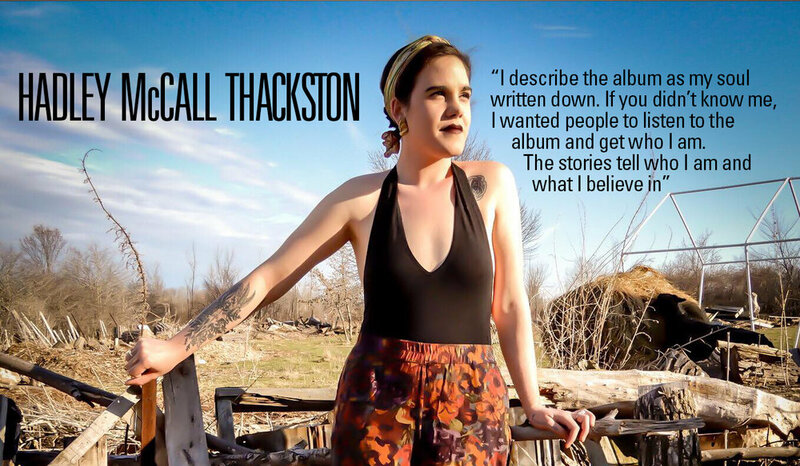 ‘’Hadley McCall Thackston has created an album that sounds like a June Carter and Amy Winehouse collaboration, written and recorded in heaven and communicated through a young artist whose vocals and poetry pay homage to both of these legends’’. So said Lonesome Highway when reviewing the Wolfe Island resident’s self-titled debut album last year. We caught up with Hadley to get the background to one of our favourite albums of 2018. Firstly, tell me about your Irish connections? Since I was little, I had this obsession about living in Ireland. I used to tell people I was living in the wrong country! After finishing high school and after graduating, I got my au pair job lined up in Ireland in 2011. After a year in Cork, I knew I would be told to leave eventually, so I applied to UCC and I got accepted to study Theatre there. At college I got to meet some musicians, I hadn’t been singing for years or song writing, so Ireland really brought music back into my life. What type of musicians did you encounter? Two lads that lived in student lodgings. We became friends, they were amazing guitar players and we started jamming in student housing and said, ‘‘let’s write something’’. One of them would write melodies and I would write the lyrics, it was sort of indie pop stuff. When I moved back to The States, I didn’t have anyone to write melodies for me and had to sit down and see if I could do it myself. I tried, I’m a basic guitar player with the basic chords, but I did write. The first songs were crap, but eventually they came along, and I decided that I could do this myself and didn’t need anyone else. When you say the songs were crap, how do you know that, they could have been impressive to someone else’s ears? (Laughs) The first one I wrote was trying to be like the artist Meghan Trainor, who wrote All AboutThat Bass, about the empowerment of women. I was so angry at the time that I wrote a song calledICould But I Won’t. It wasn’t very good, but at least I knew I could hear a melody in my head and translate that. Many of my early songs are on the record so maybe they weren’t all crap! Would you test those songs on others or just form your own opinion? At first, I wouldn’t play them for anyone else, I was so nervous. Then Wyeth Wood, a childhood friend of mine, asked me to play them for her. At that time, I didn’t know if a wanted to do Theatre or Music, but had to do one or the other. My friend told me I really should do music, so I decided to put a hundred percent attention into Music and put Theatre on the back burner for a little while. So, I became more and more confident but even when I first came to Canada from Georgia, I was shaking I was that nervous. So, it’s taken a while to get that confidence, but my voice has grown and I feel better about it now. Tell me about the move from Georgia to Canada? The artist David Corley, who Chris Brown at Wolfe Island Records produces, went to college with my mom at UGA University in Georgia. One of my friends recorded me on my porch at home and posted it on Facebook, which I didn’t want. David saw it because my mom shared it. David then showed it to Chris. I was planning to go to Nashville and try and make it there, but Chris asked if I wanted to go to Wolfe Island and record a demo there. I was supposed to be only up there for two months, so I said ‘‘sure, sure’’. Within a month a knew this was home for me, where I would want to be. I became instant friends with Chris, who said I should do a record and it all sort of snowballed from there, a weird universal thing. Tell me about the Wolfe Island Ontario experience and living up there? Its such a tiny community, there are only about thirteen hundred residents all year round. Everyone is odd in the best sense, characters in a nice way. You have old- school farmers, there are five families that have been living there for over a hundred years, so it has this lovely old time feel mixed with a modern thing, which is wholly my personality. Its like being in summer camp, you walk in to the village and everyone’s says’’ hello’’. Its an amazing community and watching the local children grow up in that environment is unlike any other place I’ve even been, it’s really special. Can you get gigs there? Yes, there are three restaurants / music bars on the island. You can go to The Witt, The Grill or The Hotel. Take your pick. We play The Grill a lot. It’s funny, I don’t really play Kingston, on the mainland, at all. Just the island or sometimes around Canada. I don’t go to the mainland to play that much; the islands are really fun and last year we had the Wolfe Island Garden Party which was great. There’s so many musicians and singers living on the island. A better move for you than heading to Nashville? Yes, it’s just as well I didn’t go to Nashville, they would have chewed me up and spat me out! I could possibly go to East Nashville now, but I feel I’m still so new and don’t know what’s going on half the time (laughs)! I’m still learning, sound checks are even new to me (laughs). Certainly, I want to make it down there at some stage, a Southern tour is a goal of mine. I really want to play down there. How long was your debut album in the making? Two years, Chris had his fingers in so many pies at the time and I was still writing, I only had five songs that I’d written before moving to Wolfe Island. I wrote five more on the island, so it took a while, but it was worth it. I believe that all the songs on the album were written outdoors? Yep, on porches. In the South every house has a front porch, either screened in or open, but all covered, as it’s so hot in the summer. When I was in Atlanta the porch became the place where I’d like to write and when I moved to Canada it so happened that my roommate that I’m living with, her house has a wraparound porch. It feels so Sothern overlooking the hills, so I wrote the rest of the album there and on Chris’ front porch also. I was porch hopping, starting a song somewhere and maybe finish it elsewhere but always outside where I seem to get inspiration, it’s comforting. The song Somehowis a particular favourite of mine. Tell me where it came from? Ellipsisis also a lovely song, with its theme of adolescent vulnerability? Well, writing that was actually therapy for me, I was really struggling at the time. I’ve never been successful in relationships, not putting myself out there at times when I should, that was what inspired that song. Butterflyis possibly the most striking statement on the album. A heartfelt prayer to unshackle oneself from the pressures that imprison young people in todays commercialised world? What frustrates me most about the music industry today is the sexualisation of women and young girls, often by women. Songs being sung about nothing really, with inappropriate images selling the songs. And young girls listening and seeing that, that’s not what they need. It causes so many confidence issues with girls, body issues. Personally, it really affected me growing up, I really struggled. I was talking to Chris (Brown’s) niece Ella, about this. She’s fourteen now and I see a lot of myself at that age in her. We were talking all about it around the time my own niece Caroline was born. So, the song came together, the second half of the song was about Caroline and Ella is the butterfly. I was asking girls to empower themselves and be strong, there’s so much more to us than just a face and body. I’ve nannied kids since I was in my teens and I’m thinking ‘’are the parents actually listening and looking at what their daughters are exposed to’’. It’s so toxic and being aware of how it affected me growing up, struggling with body dysmorphia, I really wanted to write a song that girls could listen to and feel empowered by. Because in the industry everyone’s a product and I’d love to get in there and say ‘’ c’mon girls, you don’t need to be wearing shorts and crop tops, you’re not even singing, just shaking and dancing around the stage’’. And there are so many amazing female artists out there singing beautiful things but we’re not hearing it, certainly not on Top 40! With the album hitting the thirty minute mark, were you tempted to include any cover songs on the album to lengthen it? I describe the album as my soul written down. If you didn’t know me, I wanted people to listen to the album and get who I am. The stories tell who I am and what I believe in. I was never tempted to include any covers. There are covers that I love performing, but for me I really wanted every song to be written by me from my heart. I also think a thirty-minute album is just perfect, a little treat! I also like the idea of shorter songs, where the writer has said enough in maybe just over two minutes and does not need to keep going on. I’d prefer to quit when I’m ahead and tie it neatly with a bow! David (Corley) is amazing, he can write a twelve-minute song. I can’t imagine doing that. I prefer tiny little things, that’s how my brain works. Mountain Song,the last track on the album, I could have added another verse or another bridge, but I said ‘’No, that’s perfect as it is’’. I talked a lot to my producer Chris about this and were happy with where it ended up. The album crosses many genres from old time country across blues and even jazz. What were you listening to as a young girl growing up? A really wide variety, both my parents were complete music heads. Emmylou Harris, Iris DeMent, Lucinda Williams, Bob Dylan, Elvis Costello, Patty Griffin and The Carter Family were all around me at home. The Beatles were my favourite, but I also love classical music, I played double bass in an orchestra growing up. I listened to a variety of music but I guess my roots are in female singer songwriters. My first memory of music is at three or four years old, making my parents play Maxwell Silver Hammerfrom Abbey Road by The Beatles over and over again. A totally morbid song, but I loved it (laughs). I loved a lot of Irish artists too, The Chieftains, The Pogues, The Cranberries, The Dubliners, I grew up with all those too. The Chieftains Christmas album is still my Christmas album. I just love music and don’t limit myself, any genre as long as its good. Have you writing more songs for another album? I have lots of things started but I do want to do something completely different next time around. I love the way acts like The Decemberists always do something different, not afraid to try anything. I’d like to do something that people would think ‘’Oh, I didn’t expect that of her’’. I just want to roll with it and not limit myself, I’m just having fun at the moment and going with the flow. Female artists and radio play, an ongoing industry hurdle? It’s a hard place to be but I’m all for just getting in there and having a go. Most of what’s played on the radio is just the same stuff regurgitated. I just don’t want to hear that anymore. Amy Winehouse had a great quote ‘‘I turned on the radio and couldn’t hear what I wanted, so decided to make the music I wanted to hear’’. That really stuck with me and it’s how I feel as well. You were heading to Static Roots Festival in Germany last year to play backing vocals in The Stephen Stanley Band, when one of the other artists pulled out at the last minute and you got your own showcase slot. How did that feel? You could probably see my heart beating in my chest at the time, I was so shocked! It was my first tour and my first festival. I only got in one rehearsal but after that I was ok and could breath again. I just have to focus on my career now!